Rise & Shine is a true “think and gun” that combines elements of arcade shooters, bullet hells, and puzzle platformers to create a new blend of strategy and viscera. Switch between Shine’s add-ons to solve puzzles that redefine what bullets can do. Guide projectiles through intricate mazes, electrify damaged equipment to discover new pathways, and juggle 8-bit fruit because why not? This is NOT another run’n’gun clone at all. This is something different and fresh. Don’t let the cute character models fool you, saving Gamearth won’t be easy. Prepare to dash flurries of missiles and avoid unseen traps as you fight to prevent its destruction. It’s going to take all you’ve got to stay alive in the face of lethal robot armadas, enormous bosses, giant death wheels, and (of course) brainthirsty zombies. You’re not gettin’ through this in one piece, kiddo. Enter a world where every level is a single, continuous work of art. Each level is composed of hand drawn illustrations with multiple parallax scroll layers so every forward step is new; no tiling or repeated elements. This meticulous attention to detail allows each frame to flow seamlessly from one to the next, a quality you’ll wish you had on your 20th respawn. 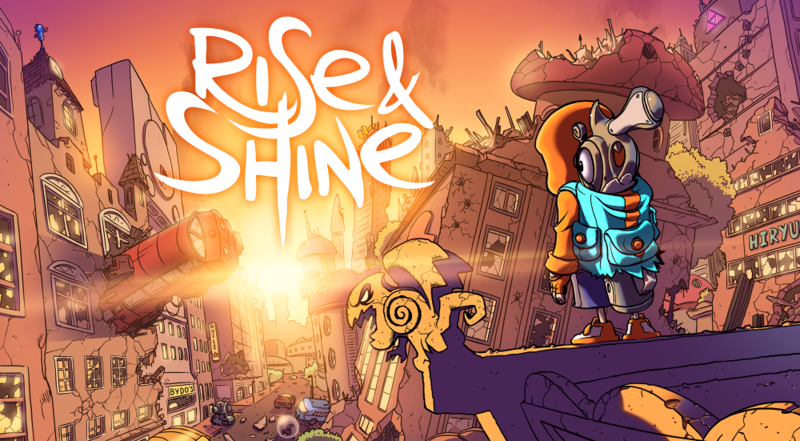 Rise & Shine is available on Xbox One, PS4 and PC. Rise & Shine Steam Page.